When Rusparadox tries to hibernate his PC, the screen goes black for a few seconds, then wakes up. He asked the Desktops forum for advice. This is a tough one to track down. But one of the following tests may help fix the problem. First, check your BIOS settings. I can't tell you exactly how to do this--it varies from one PC model to another--but here are the basics: Boot your PC and look for a message, one of the first to appear, that tells you to press a particular key for "Setup." If there's no such message, try F2. If Windows starts loading, you didn't press the key at the right time; it may need several tries to succeed. When you do succeed, you'll find a text-based menu screen. Search for a section called "Power Options," "Wake Up," or something similar. Make sure that any sleep, power-saving, or hibernation settings are on. In the resulting Device Manager, expand the Network adapters section, right-click your adapter and select Properties. 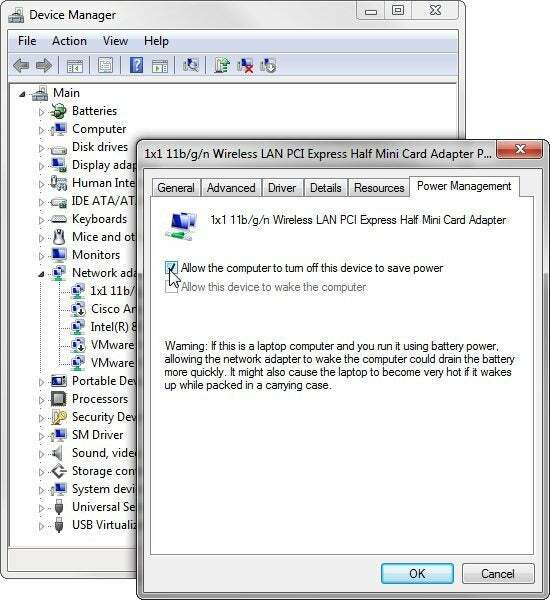 Check Allow the computer to turn off this device to save power and uncheck Allow this device to wake the computer. Did that solve the problem? No? Then try updating your drivers--especially your networking, video, and audio drivers. You'll find information on them, including version numbers, in Device Manager. Just right-click a driver and select Properties. You'll also find an Update button in each driver's Properties dialog box. Unfortunately, that button seldom helps. The most reliable way to update drivers consumes the most time: searching manufacturers' Web sites. For other options, see Four Driver Update Utilities: Which Ones Can You Count On? Sometimes other peripherals can cause problems. I've never seen it, but I've heard of USB hubs keeping a computer from hibernating. Unplug printers, scanners, hubs, and other USB devices and see if that fixes the problem. Finally, it might be a program. Try hibernating as soon as you boot--before you load any applications. To test programs that load automatically when you boot, click Start, type msconfig, press ENTER, and click the Startup tab. Uncheck everything and reboot. If the problem goes away, start experimenting with checking some items and unchecking others until you find the culprit. My thanks to LiveBrianD for his contributions to the original forum discussion.